Join Broken Anchor Poetry here! 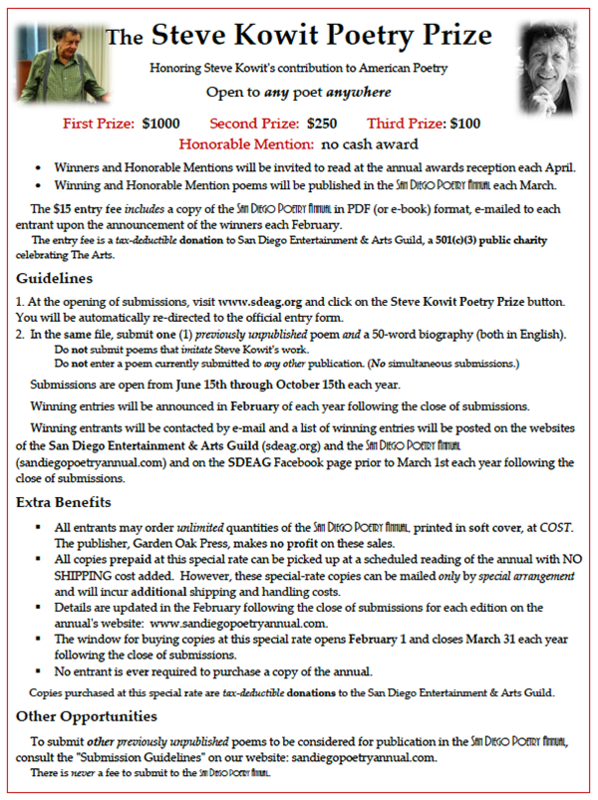 Submit to the San Diego Poetry Annual before time runs out! On Friday, Oct. 26, Poetry & Art Series 2018 presents the $1,000 Youth and Adult Poetry Performance Prize. There will be two winners (youth, 17 and younger; and adult, 18 and over), each taking home $500 for one original poem read and/or performed. A panel of local performer/author judges — including artist and publisher Ted Washington, neurocognitive researcher and author Ying Wu, and award-winning performance artist Gill Sotu — will choose the youth and adult winners. There will also be three $50 People’s Choice prizes, chosen by the audience by secret ballot. Winners and selected participants will have their poems, bios, and a picture published on poetryandartsd.com. Hosted by Michael Klam. DJ Gill Sotu will provide music and sound throughout the evening. The $1,000 Poetry Competition will take place in the San Diego Art Institute, a 10,000-square-foot gallery space in Balboa Park, 1439 El Prado. This interactive arts and culture experience will include beverages, snacks and time to mingle. Doors open at 6:30 p.m., and the event starts at 7 p.m. on Friday, Oct. 26. Members are free, nonmembers $6 at the door. There will be no more than 15 youth poets (17 and under) in the first round and no more than 15 adults (18 and over) in the second round. Poets will sign up on the night of the slam or by e-mail. If there are more than 15 names in each category, the event host will choose participating poets by lottery. Poets can write to Michael Klam at mkklam@gmail.com to get their names in the hat for a chance to compete and/or get in the lottery. Audience is very important, so poets are encouraged to bring fans and followers. The audience will be emboldened by the host to influence the judges and each other by applause, cheers, roaring, and even powerful silences. Each poem needs to be under three minutes and 10 seconds. Going over time limit will be reflected in the judges’ scoring. Poets are encouraged to bring their absolute best game. This is a free speech, all ages event. No poems or performance will be censored. All styles are welcome. Poems can be political, personal, playful, comedic, serious in tone, anything goes. The content of the poems belongs to the poet, and ideas and beliefs may not represent those of the San Diego Art Institute or any other member of the audience.